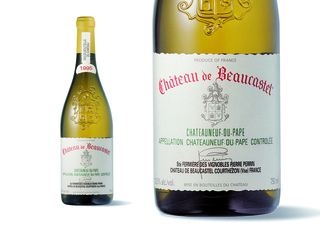 The 1995 Chateauneuf du Pape blanc (80% Roussanne, 15% Grenache Blanc, and 5% various other white wine varietals) sees 25% small oak casks. It is a rich, dense, opulently-styled wine with copious quantities of honeyed fruit, considerable power, and a rose petal/honeyed richness with a touch of toast and spice. Drink this long, delicious, thick Beaucastel over the next few years before it closes down. It will age for 10-15 or more years.